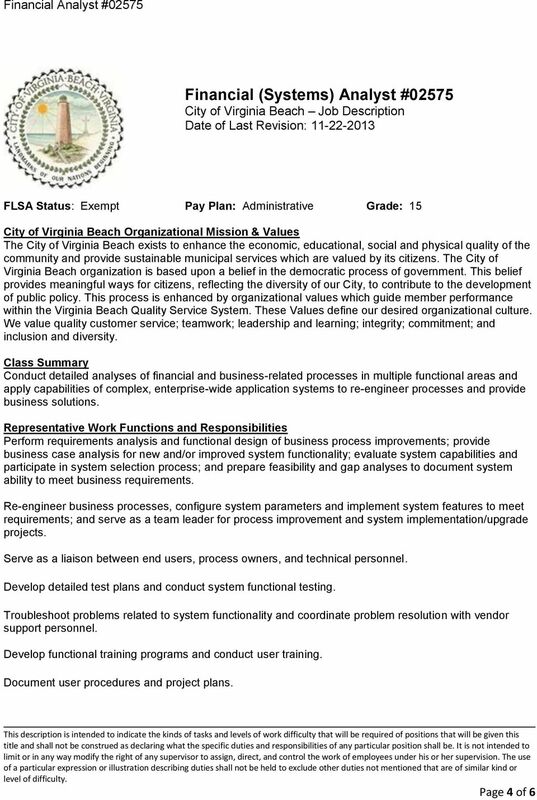 Download "Financial Analyst #02575 City of Virginia Beach Job Description Date of Last Revision: 11-22-2013"
1 City of Virginia Beach Job Description Date of Last Revision: FLSA Status: Exempt Pay Plan: Administrative Grade: 15 City of Virginia Beach Organizational Mission & Values The City of Virginia Beach exists to enhance the economic, educational, social and physical quality of the community and provide sustainable municipal services which are valued by its citizens. 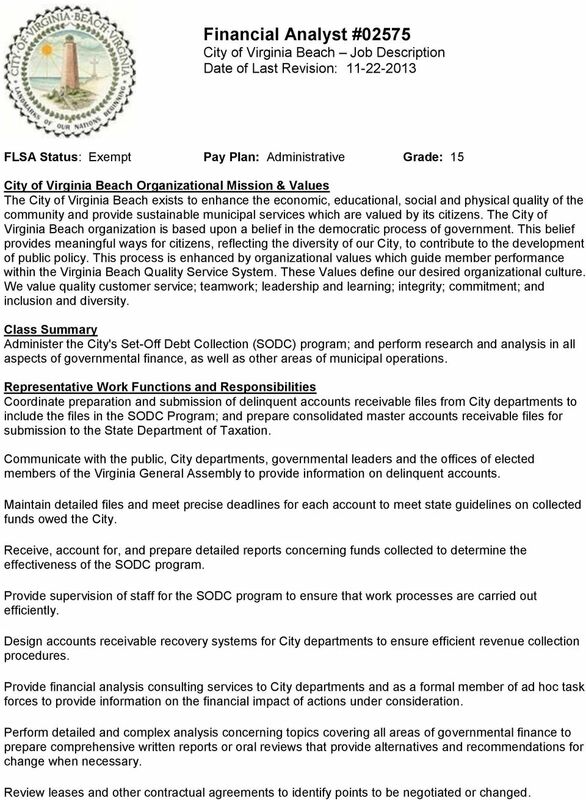 The City of Virginia Beach organization is based upon a belief in the democratic process of government. This belief provides meaningful ways for citizens, reflecting the diversity of our City, to contribute to the development of public policy. This process is enhanced by organizational values which guide member performance within the Virginia Beach Quality Service System. These Values define our desired organizational culture. We value quality customer service; teamwork; leadership and learning; integrity; commitment; and inclusion and diversity. 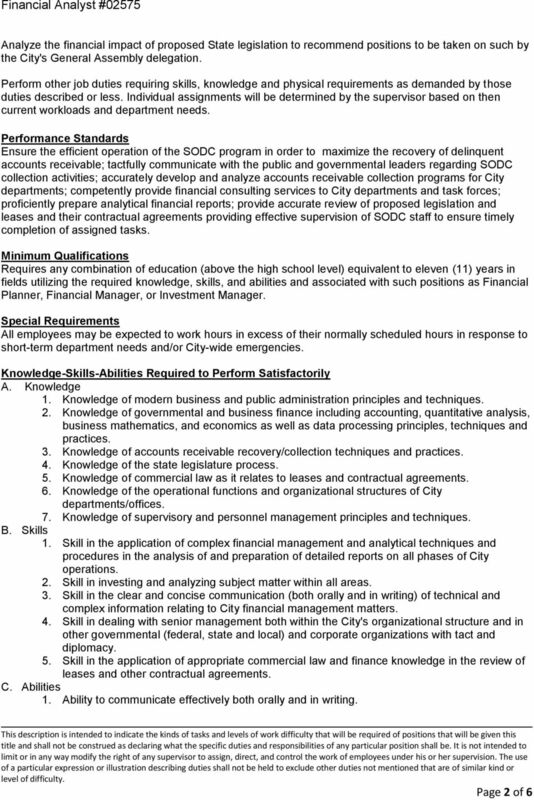 Class Summary Administer the City's Set-Off Debt Collection (SODC) program; and perform research and analysis in all aspects of governmental finance, as well as other areas of municipal operations. 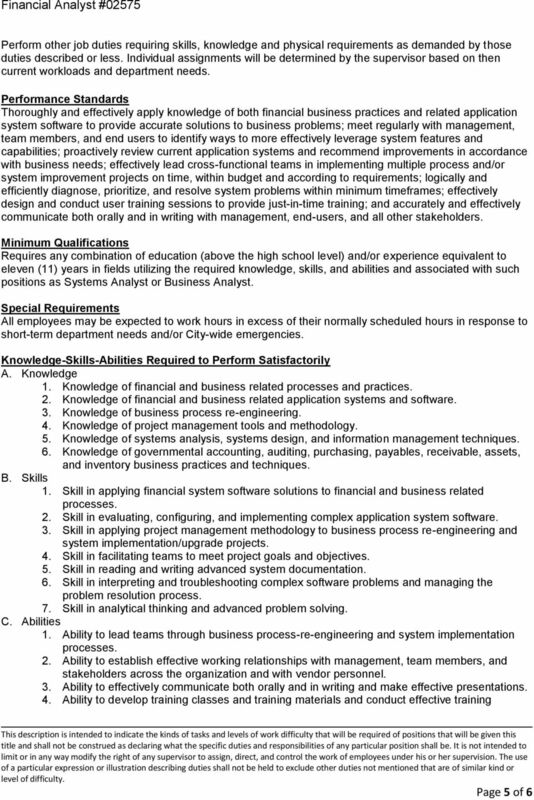 Representative Work Functions and Responsibilities Coordinate preparation and submission of delinquent accounts receivable files from City departments to include the files in the SODC Program; and prepare consolidated master accounts receivable files for submission to the State Department of Taxation. Communicate with the public, City departments, governmental leaders and the offices of elected members of the Virginia General Assembly to provide information on delinquent accounts. Maintain detailed files and meet precise deadlines for each account to meet state guidelines on collected funds owed the City. Receive, account for, and prepare detailed reports concerning funds collected to determine the effectiveness of the SODC program. Provide supervision of staff for the SODC program to ensure that work processes are carried out efficiently. Design accounts receivable recovery systems for City departments to ensure efficient revenue collection procedures. 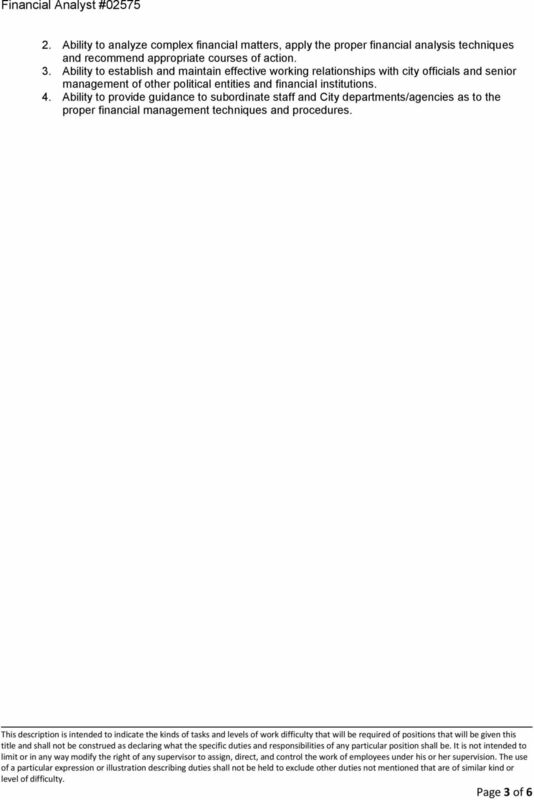 Provide financial analysis consulting services to City departments and as a formal member of ad hoc task forces to provide information on the financial impact of actions under consideration. Perform detailed and complex analysis concerning topics covering all areas of governmental finance to prepare comprehensive written reports or oral reviews that provide alternatives and recommendations for change when necessary. Review leases and other contractual agreements to identify points to be negotiated or changed. 2. Describe this employee s important accomplishments during the past year. Please provide examples. Position Classification Flysheet for Inventory Management Series, GS-2010 Table of Contents SERIES DEFINITION... 2 EXCLUSIONS... 2 OCCUPATIONAL INFORMATION... 2 TITLES... 6 GRADING POSITIONS... 6 U.S.